Just look at how colorful they are! B-e-a-u-t-i-f-u-l. Typically when it comes to cookies, I’m a chocolate chip cookie kinda girl. However, I am surrounded by sugar cookie lovers. My boyfriend, my siblings, and friends all love sugar cookies. Not that I’m a sugar cookie hater, but I typically gravitate towards sugar cookies around Christmas time, it’s just what I associate them with. But, these aren’t your typical cookie cutter type sugar cookies. These are super soft, tender, ultra chewy and have a delicious vanilla-y taste and aroma. They are not smack you in your face sweet, but have a subtle sweet buttery flavor. They bake up so beautiful and have a light, tasty crumb. These really are the *perfect* sugar cookies, if I do say so myself. One thing that I love about this recipe – no chilling time! I usually would never ever recommend not chilling cookie dough before baking them because it aids in making the cookies thick & puffy. A must for delicious cookies. But with these particularly cookies, you can skip this step, which means less work and less wait time. As soon as the dough is combined and you’ve rolled them around in sugar or sprinkles you can bake them. In 10 minutes you’ll have cookies. How awesome is that?! Once you have the dough balls placed on your cookie sheet, take a small drinking glass and lightly push down with the bottom of the glass on top of the dough ball. 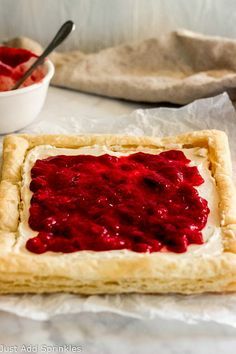 The trick is to just flatten them slightly, you still want them to be thick and puffy but this just helps them spread a little more. DO NOT completely flatten dough balls while doing this technique. Also, make sure not to bake them past 10 minutes. At 10 minutes these cookies are soft, chewy and incredibly tender. Once they cool they stay soft and chewy but are firm enough to hold their shape. Since I used a medium sized cookie scoop I got 20 cookies out of this recipe. You may want to double up because these go quick, especially if your planning on making them for friends & family. It’s always better to have too much than not enough right? Preheat oven to 350 degrees. Lightly spray a cookie sheet with cooking spray or line with parchment paper. Set aside. In a small bowl, combine flour, baking powder and baking soda. Stir dry ingredients together for a few seconds to just mix it together. Set aside. In a large mixing bowl cream butter and sugar together using a hand held mixer or stand mixer on medium speed. Mix for 2-3 minutes so butter is light and fluffy. Add in egg, vanilla, and almond extract. Continue mixing until egg and both extracts are combined. Turn the mixer speed to low and slowly add in dry ingredients. Continue mixing on low speed until dry ingredients are fully incorporated and cookie dough is formed. Pour additional sugar or sprinkles (or both) onto a small plate for rolling. Scoop 1.5 tablespoon sized dough balls and roll each one in between your palms to make a circular shape. Roll individual dough balls in sugar/ sprinkles until completely covered. Place dough balls on cookie sheet about 2 inches apart, you may need to make smaller batches at a time. Using the bottom of a small drinking glass, light press on top of each cookie to slightly flatten it. Do not completely flatten, cookies should still be thick. Bake for 10 minutes. Remove cookies from oven and all to cool for about 15 minutes so the cookies have time to firm up slightly. Serve immediately. I used Wilton rainbow nonpareils that come in a 3 oz bottle. To completely cover all 20 cookies with sprinkles I used 1.5, 3 oz bottles of rainbow sprinkles. If using regular sugar you’ll need about 1/4 to 1/2 cup of sugar for rolling. Thank you Bethany! These are perfect for kids, especially because of the sprinkles 🙂 I don’t do much gluten free baking myself, so if you give these a gluten free twist, let me know how it comes out. Happy Baking! Does it really make a difference if you don’t add in the almond extract? Also my dough always comes out too stinky and runny to roll into balls, is there something I’m not doing right? The almond extract may be omitted, this recipe only calls for a tiny measurement of it, it’s just a little something special I like to add to them for flavor, but you can easily do without it. As for the cookie dough itself, it should be sticky. This kind of sugar cookie dough isn’t like the roll out, cookie cutter dough. This dough is thick and sticky, but shouldn’t be runny. For best results, I recommend following the recipe step by step, did you do something different? I followed step-by-step, maybe runny just wasn’t the right word lol thank you! So pretty, they look awesome. Can you store these in air tight tubs?? When I make these they don’t turn out sticky enough for the sprinkles to stick to them. What should I add to the dough to increase the stickiness? Thanks! It may be the way you are measuring the flour. If they aren’t sticky enough there is too much flour. Make sure you are lightly spooning the flour into the measuring cup and not tapping it down in anyway. It’s best to stir the flour first also. It should be airy. It’s easier to add more flour if the dough is too loose than it is to fix if it is too dry. Did you follow the recipe as written? I’m not sure what could be added without changing the flavor or texture of the cookie. I usually make the dough as usual and roll them in sprinkles and directly after. They should stick just fine. Let me know if it works out for you. I was going to make spiral cookies for our bake sale, but didn’t read the entire recipe until the night of. I didn’t realize how much chilling that dough would need. I’m glad I found this recipe. I followed it exactly as written and rolled them in Wilton jumbo nonpareils. The dough was just sticky enough, yet firm enough to gently press into the sprinkles. They were pretty and tasty. Cookies sold out quick!!! Thank you so much for considering these cookies for your bake sale! 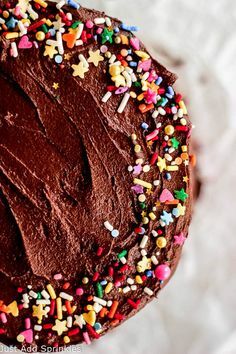 Sprinkles are always a good option, right?! I’m so happy the recipe worked out for you and was a bake sale success. Thanks for stopping by Rowena! I picked up sprinkles (or jimmies depending on where you’re from) then realized you used nonpareils. Do you think regular sprinkles will work? Thanks for responding! I decided to pick up the nonpareils just in case. My nephew is away for college and I wanted to make him something that could be mailed, but kind of birthday-ish (that’s a word, I swear!). I will do a couple with sprinkles to test them. Hi, I followed your recipe exactly and the cookies tasted delicious. The only problem was when I rolled them in the sprinkles, I couldn’t get the sprinkles to stick to the dough so they were not as pretty as the samples in the photos. Any suggestions? I’m sorry about the problem with the sprinkles not sticking to the dough 🙁 I usually scoop the cookie dough, roll it into a ball with my hands and then roll them around in sprinkles using a little bit of pressure so they stick. If the dough ball loses it’s round shape I just re-roll it in my hands. Did you pour the sprinkles onto a plate or shallow bowl first? I know that may seem like a silly question but it helps. Also was the cookie dough sticky before you rolled it? Hope this is helpful, let me know if you decide to give them another shot and let me know how it works out for you! Ive made these once before and they were AMAZING! My family and I are getting together to make christmas cookies tonight- and this is the only recipe i want to use! I know you say they arent really cookie cutter cookies, but if i chilled the dough for a few hours do you think they could be rolled out and cut? Love these cookies! I was wondering would it be possible to make the dough tonight and refrigerate it overnight and bake them tomorrow without any issues? Hi Ashley! You can definitely make the dough ahead of time and refrigerate overnight. If you want to take it one step further and save yourself even more time, you can make the dough tonight, scoop the dough balls out and roll them in sprinkles or sugar (whichever your preference) and keep them in the fridge tonight so all you have to do tomorrow is preheat your oven and place the balls on the cookie sheet and bake. Happy Holidays to you and happy baking! I NEVER comment on recipes-once in done in the kitchen, I’m done. But these are comment worthy. Hands down best cookies ever. And I love cookies. And so easy!!! Thank you so much!! My event I need these cookies for is not for a couple of weeks. Can I make these ahead of time and put in the freezer? Hi Amy! Yes, you can definitely make the dough ahead of time. I would recommend making the cookie dough according to the instructions including rolling them in sprinkles and store the cookie dough balls in the refrigerator in a sealed tupperware container. Cookie dough can be made and stored up to 1 week before baking. That’s the longest I’ve ever stored it for so anything longer I would not be sure of the results. Good luck, let me know how the work out for you! I baked these tonight with my grand-daughter and she had a ball. She can read a recipe, measure ingred. and mx. This is an awesome recipe. She can do it all and we had a great time and made a great cookie. These look so good! I’m going to make them for a baby sprinkle but wanted to make them bigger.. Maybe 2 tbsp. Do you think I need to increase cooking time and how far apart to place cookies on cookie sheet? Could the 1 cup of butter be replaced with 1 cup of coconut oil? I made these for my students as an end-of-the-year gift. They loved them! Thank you Sarah! I’m so happy your students loved them!!!! just made these and they are sooo yummy! (and easy!) i had my three year old help roll all the balls and she loved it. can’t wait to recommend these on the blog tomorrow! Thank you so much, Karli! Am I able to freeze these bad boys?? I have a bake stall next weekend and I reckon these babies will sell like hot cakes!!! I like to get all my baking done early since I’m so busy during the holidays, I freeze all my cookies and never had a problem with them being fresh when defrosted . Can these be frozen? Neris, thank you so much for the incredibly sweet comment. Hearing about the happiness that a recipe from my blog has brought you & your son has touched my heart deeply. Thank you so, so much for sharing that with me! Used this recipe but omitted the almond extract and folded the sprinkles into the mix. Turned out very good. I made mini cookies for little kids. These cookies are on the softer, chewier side. I hope you enjoy them! These came out AMAZING! My kiddos have been begging to bake since our newborn has been born, but I haven’t had the time or energy. Today we found this recipe together and it was quick, easy and so much fun. My 4 and 2 yr old, were amazed when they came out of the oven and cannot wait to surprise their sister and dad, when they get home today. Thanks for sharing a recipe that will be a new staple in our family. We were able to make, bake and try these all while the baby watched peacefully! 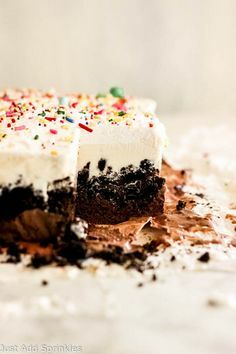 I made these for my sprinkle loving kids and they came out great! We all enjoyed them! Easy recipe, delicious cookies! Thank you! These were super easy and fast to make. They have such a fun look too! They are cooling now…can’t wait to try them! My 11 year old boys and I super approve! So yummy! Will make again! I had no trouble with anything, didn’t have almond extract so used all vanilla and instead of rolling them in sprinkles, I just sprinkled them on so there’s not so many. Hello I do not have baking soda will the cookies still come out great? Hi Suzanna! Baking soda is actually a pretty important ingredient, it’s a leavening agent meaning it’s important for how the dough will form as it bakes. I wouldn’t suggest skipping it. Hope this was helpful! These cookies are amazing! My husband’s office pulls names to buy/bake for coworker’s birthdays. The coworker he pulled asked for “sugar cookies rolled in sugar”. I’m a cake decorator and cookie decorator so I was a tad nervous that I’d be doing something I normally don’t do. But oh my my….These are AWESOME! His coworker loved them. Rebekah, thank you so much for the sweet comment. I’m so happy these cookies were a success for you & your family. I love the lemon flavoring idea, thank you so much for sharing with me! Subscribe today to get the latest posts delivered to your inbox.